We were visiting Ballarat with friends and were a little worried about finding somewhere that would seat 8 of us for a casual dinner after 8:30. It was no problem to get a table at the George Hotel. We sat in the dinning area, behind the main bar which was quite lively, especially when we left. There were a few other groups of diners. The menu was slightly unusual for a pub, featuring a variety of asian dishes alongside more standard pub food. I went for the fisherman's basket, with prawns, scallops and calamari as well fish, chips and salad. It was all pretty well cooked and tasty. 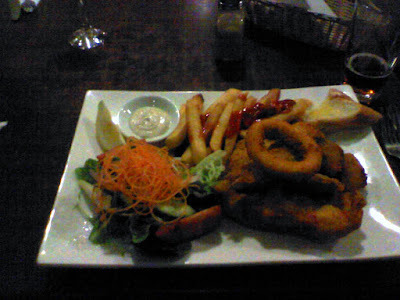 Other diners had a mix of dishes, the steak got a thumbs down, but most people were happy.